This is an interesting 1754 map by Gabriel Ramirez depicting the map of the Geographical System of the ancient Greek geographer Ptolemy. The map covers the regions between Spain and Southeast Asia. Of course, the world of the ancient Greeks centered on the Mediterranean and the Americas had yet to be discovered. Europe, Asia, and Africa were however known, leading prominent geographers of the ancient world to adopt a three part world model – a system that would remain in use until the era of Martin Waldseemuller in the early 16th century. Though somewhat difficult to understand at first glance, this map corresponds to many actual locations and is upon close examination yields some of its secrets. The Ganges River Valley is readily identifiable as is the island of Tabra Pana or Taracori – an ancient Ptolemaic reference to Ceylon. The Indian subcontinent itself is barely discernible. This map's most intriguing element is the southward extension of land running along the eastern edge of the map and extending beyond the border. This landmass reflects speculation, inspired by Ptolemy, that the Indian Ocean was landlocked. It was believed that this landmass extended far southwards before turning westward and connecting with eastern Africa. Though the exploits of Vasco de Gama and Magellan had proven that the Indian Ocean was not fully land locked, it was believed that a large tract of land, possibly even America, attached to Asia west of Malaya or the Chersonesus . Thus the 'Great Promontory' or 'Dragon's Tail' that appeared on many maps of this region well into the 16th century. It is worth noting the superiority of the Ptolemaic system which would come to dominate European cartographic presentation until the discovery of America. 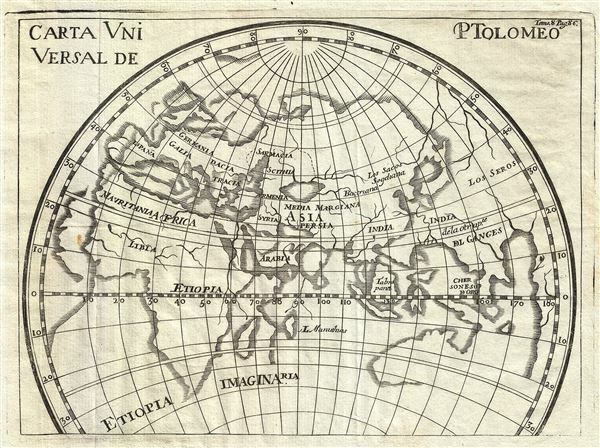 This map depicts the geographic system of Alexandrian geographer Claudius Ptolemy. Originally prepared in French by Abbot M. Pluche and translated into Castilian Spanish for publication in Volume VII, Part 4 of D. Gabriel Ramirez's Espectaculo de la Naturaleza, O Conversaciones a Cerca de Las Particularidades de la Historia Natural.